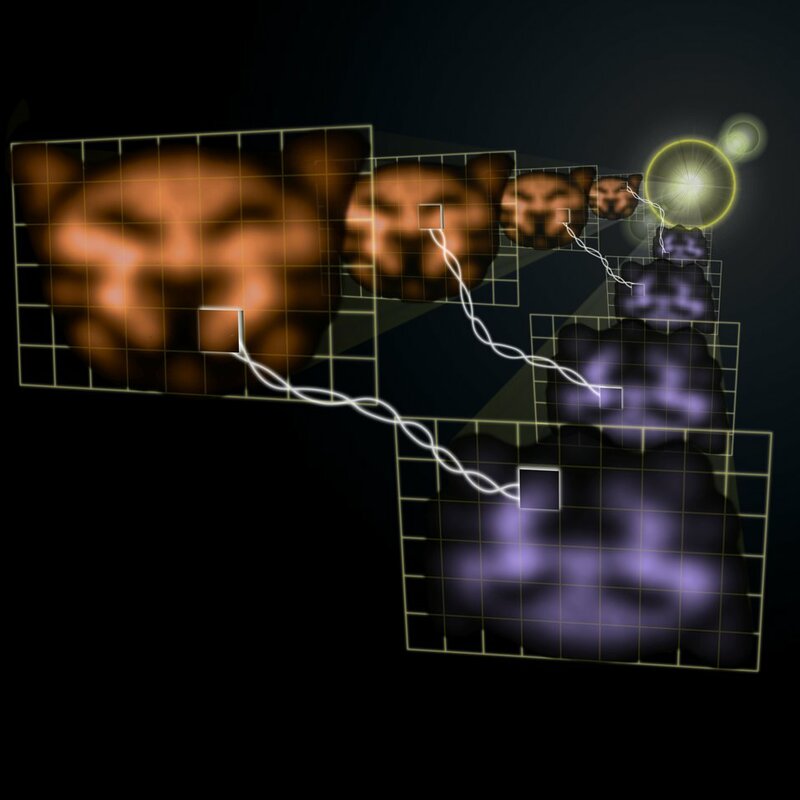 In this photo montage of actual quantum images, two laser beams coming from the bright glare in the distance transmit images of a cat-like face at two slightly different frequencies (represented by the orange and the purple colors). The twisted lines indicate that the seemingly random changes or fluctuations that occur over time in any part of the orange image are strongly interconnected or entangled with the fluctuations of the corresponding part in the purple image. Though false color has been added to the cats' faces, they are otherwise actual images obtained in the experiment. See also www.nist.gov/pml/div684/quantum images.cfm. Credit: V. Boyer/JQI Disclaimer: Any mention of commercial products within NIST web pages is for information only; it does not imply recommendation or endorsement by NIST. Use of NIST Information: These World Wide Web pages are provided as a public service by the National Institute of Standards and Technology (NIST). With the exception of material marked as copyrighted, information presented on these pages is considered public information and may be distributed or copied. Use of appropriate byline/photo/image credits is requested.